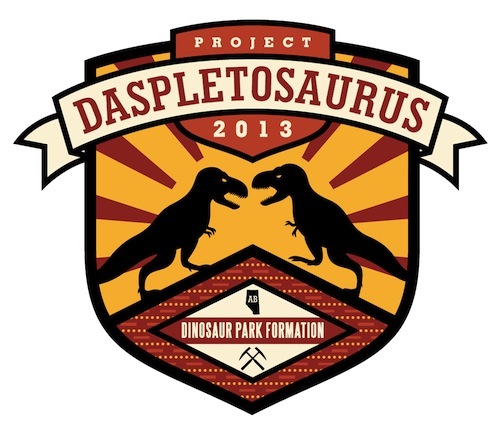 OK, just so you know, I am going to keep bludgeoning you with stuff about the Daspletosaurus project till it’s funded. Please do spare a few pounds / euros / dollars / rand / gold pieces if you can, even a little goes a long way when everyone contributes. It only takes a few moments and makes a big difference. However, while any funds at all will help me out, I can appreciate that maybe you want something in return (other than the opportunity to fund some awesome science and have me blog it to death). Well I’ve been really touched by the responses of some of my friends in the palaeoart community and people have risen out of nowhere to help out enormously. First off is David Orr of Love in the Time of Chasmosaurus fame. 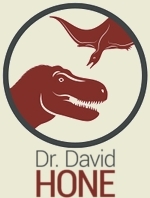 Designer of this superb logo (the details are great, he’s used the flag of Alberta as an outline, used Darren Tanke’s field hammer in silhouette, and stylised stratigraphic marks from a paper on the Dinosaur Park Formation as a background), David is now offering various pieces with this on his Red Bubble Shop (most notably T-shirts). Profits go to the project fund and obviously, a hue thank you from me for this. While David was still finalising this and getting the links up, I got a message from Brett Booth offering to do me some dinosaur-themed comic art to auction for the project! Regular readers will know Brett from his interview here and his blog Carnosauria. However, comic fans will know his work on X-Men, Teen Titans and most recently as the new artist for Nightwing, that’s some CV (and yeah, he’s filled in on Batman and Spider-Man over the years too). Starting with this effort of cannibalistic Daspletosaurus being observed by Ka-Zar in the Savage Land, Brett has promised more to come including, yes, Batman in the cave with his famous trophy Tyrannosaurus. I’ll try and blog and tweet these as they come up, but the easiest thing to do is follow Brett on twitter as @Demonpuppy It’s very kind of Brett and obviously geek heaven – dinosaurs and superheroes! Get in while you can guys. Finally, before the ink was barely dry on Brett’s sketch, I had an alert on Facebook from Julius Csotonyi (another artist who has submitted to my interviews) with an incredibly generous offer. For the next 3 weeks only, he is donating all profits for ALL art sales on his site to the project!! So head on over to his huge catalog and take your pick. It hardly goes without saying how generous this is. So there you have it, three artists have all generously given up their time and talents (and yes, even some of their earnings) to help me and my research out. I’m bordering on speechless (no mean feat) and delighted and excited. My sincere and deep thanks to them all, and I hope people take advantage of this. Sure, it helps me out, but damn there’s some cool stuff there. 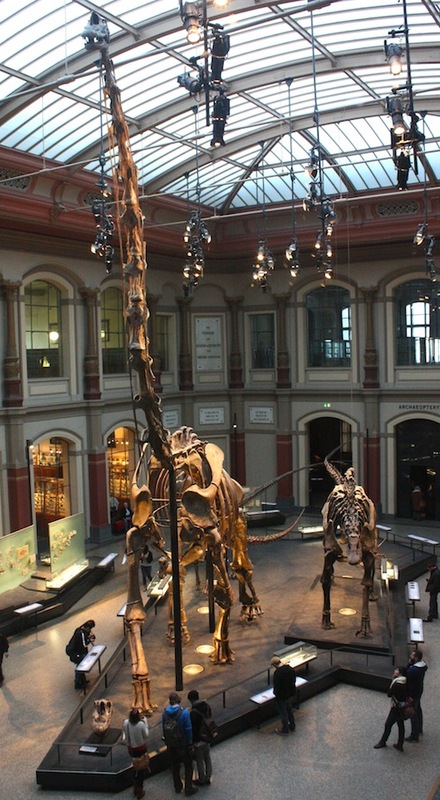 As briefly mentioned before, I’m just back from a week long trip to Berlin and the Museum fur Naturkunde (better, but now incorrectly known as the Humboldt museum). The last time I was there was around 2007 and the main dinosaur hall was empty with the material having been taken apart for remounting. So while I was there to dig into the collections and check out the material available, it was a chance to see how the new exhibits (plenty more than the dinosaurs have been done) look. 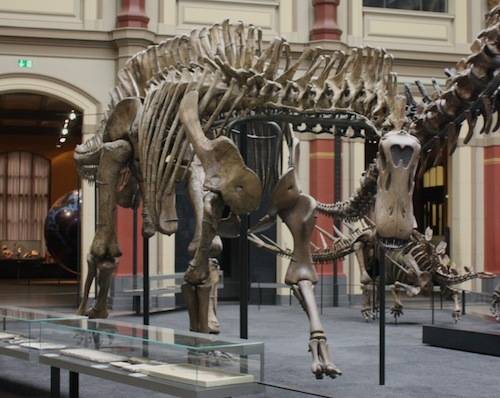 I’ll stretch it out a little and break this up into various small slots covering different aspects of the exhibits and first off let’s not sidestep the obvious – they have a full sized, mostly real bone, mounted Giraffatitan. 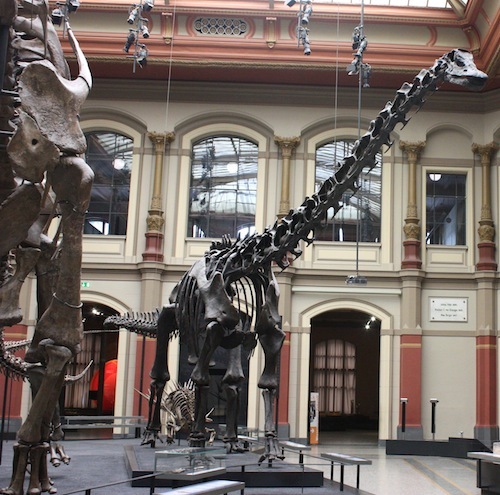 Yes this is a far from tiny mount, it’s absolutely colossal and that’s most apparent when you see that it’s next to Diplodocus (also shown at the top) – the sauropod that most people have probably seen in a museum and are most familiar with. Giraffatitan simply *towers* over this and in every dimension except total length is clearly a much, much larger animal. The remounting here gives both of these animals a more ‘modern’ look and less tail-draggy and generally upright. One really nice addition is the cervical ribs being added to the G. mount, giving it a much more accurate neck and showing off this often missing (or badly handled) feature of sauropod necks. The third in the sauropod trio is the fascinating and short-necked Dicraeosaurus. Indeed, between the three, you have a really classic in Diplodocus, a real giant in Giraffatitan (and a very upright one to boot), and then a relatively small and short-necked animal in Dicraeosaurus. This guy does have a short neck, but look at the height on the cervical nerual spines and that lovely bifurcation into pairs of spines. And finally as a little bonus, I took this one as it looked like a nice novel view, but on reviewing it in hindsight, it’s clearly in ‘Luis-Rey-O-Scope‘. I’m just back from a quick visit to Berlin and so once I’ve caught up with all the usual stuff that gets behind from being away there’ll be some blogs coming on the exhibitions, Berlin Tier Park and others. 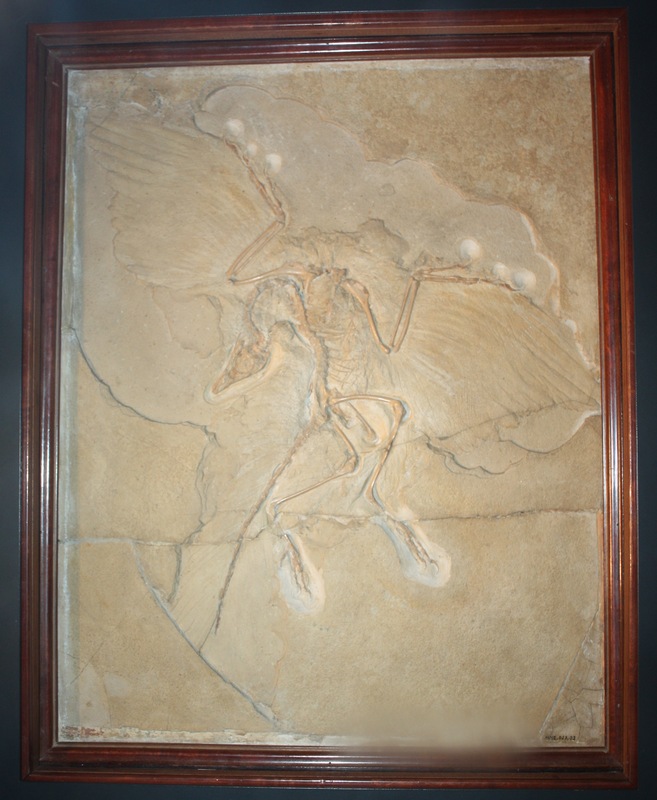 Meantime though, here’s the Berlin Archaeopteryx. I have seen this magnificent and legendary specimen a couple of times before and have some old analogue photos, but now have some nice shiny digital ones to put up here. Oddly this is the one obvious specimen that’s been missing from my ‘collection‘. It has been on here before thanks to Heinrich Mallison, but now I can add my own shots to flesh this out with a couple more. Previously on Archosaur Musings . . . I suspect no malice on the part of Lucy and her question, but her inquiry had inadvertently put me in a corner. She had asked a good question . . . so good that I had already devoted two chapters in my master’s thesis to thinking about it and had two papers addressing the question in the works. So, I had the wherewithal to answer it, and that was my dilemma. I am of the opinion that science should not be a covert affair. New scientific discoveries should not be closely guarded secrets. By its very nature, science benefits from transparency and from the unobstructed flow of ideas. And yet, in the modern system of journal-based publish-or-perish scientific academia, a certain level of discretion and intrigue is prudent. Otherwise, you might get scooped. You might prematurely tell one too many colleagues what you are researching and what your results are, and, next thing you know, those ideas wind up in someone else’s publication. Maybe that someone else was already thinking the same thing and, upon hearing that they are not the only one following that particular line of thought, they rush to publish first. That leaves you with an outdated thesis and nothing new to report (and the best academic journals don’t do reruns). Consider, as an extreme example, what Alfred Russel Wallace’s place in the history books would be if he had kept his ideas to himself until going to print and hadn’t sent a certain letter to a certain long-bearded British naturalist. And sometimes, of course, the scooping can be downright nefarious. Both raptor tail papers have come to academic fruition, and I am now free of my research paranoia. The paper on dromaeosaurids (coauthored with my graduate supervisor Dr. Phil Currie) has been published in a special volume of Acta Geologica Sinica, and the paper examining oviraptorid tails (coauthored with Dr. Phil Currie and Dr. Mark Norell) is now available for early view in Acta Palaeontologica Plonica. If you are interested in what I think was going on with dromaeosaurid tails (and I think a lot was going on), then you can checkout the guest post that Dave asked me to do over at Pterosaur.net. That leaves us with the tails of oviraptors . . .
Oviraptors have short tails (both in terms of the total number of vertebrae in their tails and in terms of tail length relative to body length). It has been argued that such short tails are evidence that the group did go the way of the emu — i.e., the ancestors of oviraptors had reduced tails for the purpose of flight and that this reduced-tail condition was retained after the group had become secondarily flightless. In fact, it has been argued by various scientists that many groups of fully-terrestrial dinosaurs may have descended from flight-capable ancestors. It is my opinion (though many wise and respectable scientists would disagree) that some of these arguments for secondarily-flightless dinosaurs are probably valid. However, in the case of oviraptors, I don’t think that the tail lends much support to the secondarily flightless hypothesis. Let me tell you why. The wonderfully preserved skeleton of the oviraptor Khaan mckennai. Those readers who made it through my first tail post will recall that I am interested in the musculature of dinosaur tails (as inferred through digital reconstructions based on skeletal attachment sites and comparative dissections of modern animals). In particular, I am interested in the caudofemoral tail muscles. Caudofemoral muscles are part of the locomotive system. 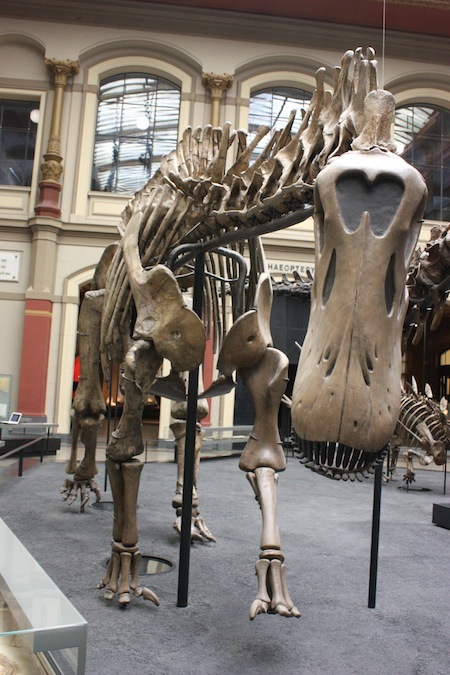 They attach via tendon to the femur, and their retractions helped to propel a dinosaur forwards when walking and running. In birds, the caudofemoral muscles are tremendously reduced and sometimes completely absent. That makes sense. To fly, a bird benefits from weight reduction, and what better weight could a bird reduce than that of a big muscle dangling off the rear that functions in land-based locomotion. Emu’s have reduced caudofemoral muscles (they compensate for this, as many birds do, by placing less emphasis on femoral retraction when they walk and run), but there is every indication that oviraptors did not have reduced caudofemoral muscles. Readers of my past post may also recall that caudofemoral muscles do not extend too far back towards the tip of the tail. Instead, most of their mass is located near the tail base (by the hips and legs). The shortening of oviraptor tails appears to have been restricted to the post-caudofemoral region of the tail – that is, vertebrae near the tip were lost — and I found no evidence that the caudofemoral muscles of oviraptors were reduced. Oviraptor tails were shortened, but not at the expense of muscles that helped them to move on the ground. Not like an emu. Digital model of the tail skeleton and musculature of the oviraptor “Ingenia” yanshini. 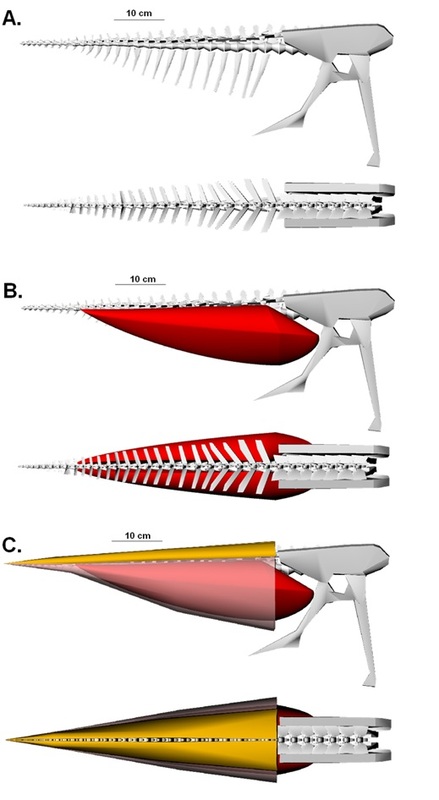 Three stages of reconstruction are shown: the tail skeleton modeled based on specimen measurements (A); the caudofemoral muscles (in red) modeled over the digital skeleton (B); and the full muscle reconstruction (C). What about the other tail muscles, are they reduced? Yes, and no. The other muscles of an oviraptor tail are considerably reduced in relative length, but not in relative mass. 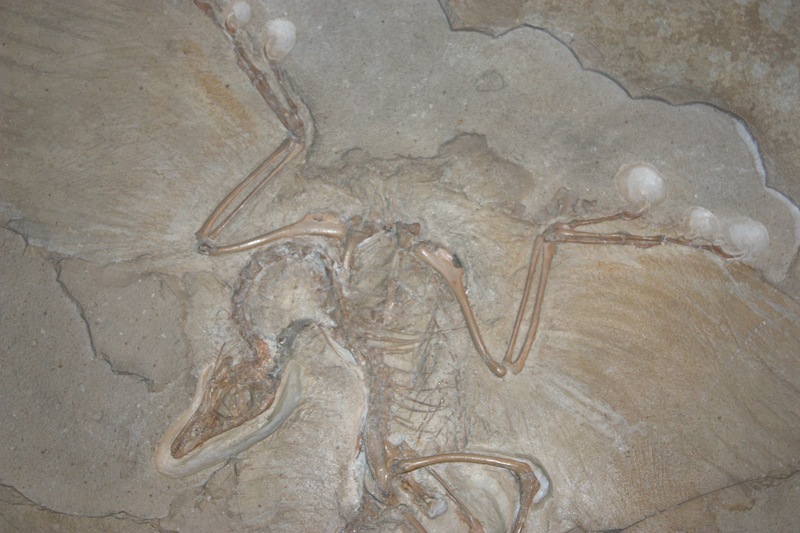 Wide caudal ribs (transverse processes), among other features of the tail skeleton, affirm that oviraptors had unusually robust tail muscles. Oviraptor tails were short, but stocky. In an oviraptor tail, the individual vertebrae were short and the vertebral articulations suggest a high degree of flexibility in between the vertebrae. So, oviraptors had a lot of flexor points crammed into their short stocky tails. Per unit of tail length, an oviraptor tail may have rivaled all other theropods in its flexibility. Then, we come to the very tip of the tail, and that’s when things really get strange. Back in 2000, it was announced that the oviraptor Nomingia had a tail that terminated in a series of fused vertebrae. This fused terminal tip was termed a “pygostyle”. Pygostyles are found in the tails of modern birds and are thought to be associated with anchoring a bird’s fanning tail-feathers. Did Nomingia have a tail feather fan? It seems likely. 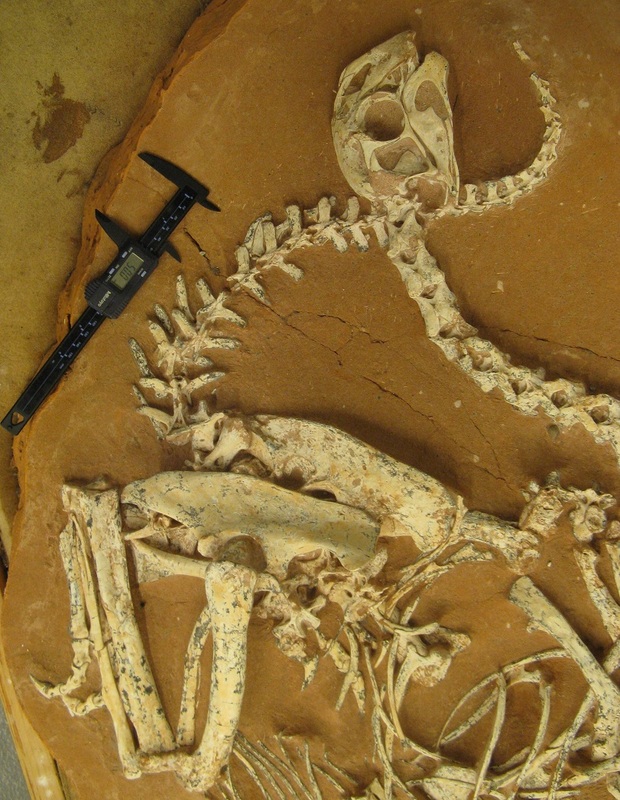 Direct proof that some early oviraptors had tail-feather fans comes from exquisitely preserved specimens of Caudipteryx and Similicaudipteryx, which actually have fossilized feathers preserved. The pygostyle of the oviraptor Nomingia, composed of five fused tail vertebrae. In our oviraptor tail paper, my coauthors and I announced the discovery of three new oviraptor pygostyles. One of these was from a second specimen of Nomingia, one was from Citipati, and one (the smallest of the three) was from Conchoraptor. 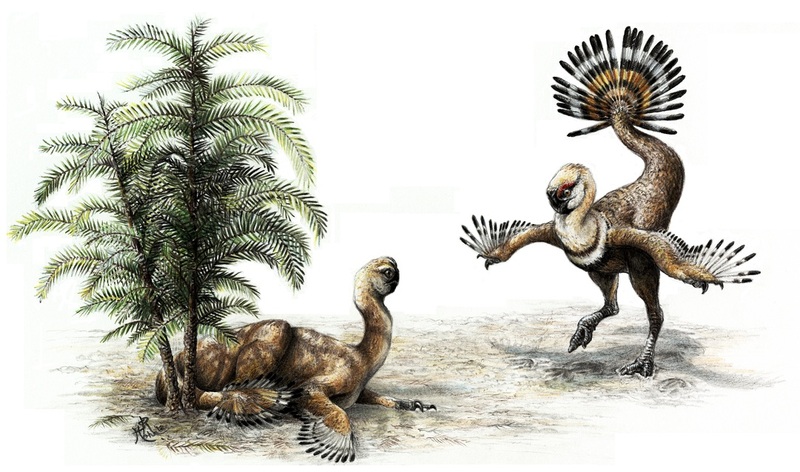 These new pygostyles suggest that Nomingia may have been the rule, not the exception, and that pygostyles along with their accompanying feather fans were probably common features of oviraptors. Muscular, flexible, and ending in a feathered flourish, what were oviraptor tails doing? I think they were flirting. What good are tail feathers if you cannot fly? A lot of modern birds make use of tail-feather fans when they are on the ground. Think about a tom turkey or a peacock. Such birds use flamboyant feather-fans as display structures, most commonly, as courtship display structures. Now, imagine if the avian ancestors of peafowl and turkeys had not been forced to abandon the longer and muscular dinosaurian tail for the sake of aeronautics. What sort of a tail might these birds “want” in order to best woo potential mates and to wield their feathery instruments of seduction? Flexible, strong, and muscularly dexterous tails. Life reconstruction of “Ingenia” yanshini, depicting a male “peacocking” to a female. Painting by the exceptionally talented Canadian artist Sydney Mohr. Lucy, I want you to know that this follow-up blog post was unsolicited. I trust that Dave humors me and posts it, and I hope you are satisfied with the answer. Sorry for the delay.